On today’s Everything Is Interesting episode, we talked about Sea Monkeys (you’re welcome) and those neat little glass biospheres they live in sometimes. The self-contained biospheres are both beautiful and amazing, because everything Sea Monkeys (spoiler alert: brine shrimp) need to survive is provided by their habitat. 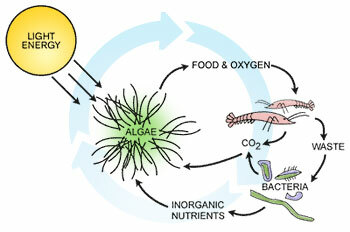 The shrimp, algae, and bacteria inside a self-contained biosphere complete a nutrient cycle loop, where all organisms are providing the oxygen, CO2, and nutrients that sustain the other organisms in the system. As promised, here’s a link to some instructions on how to make your OWN aquatic biosphere. *Note* We did not craft this document, it belongs to Anne Schultz. Thanks for letting us link to your instructions, Anne! *Another Note* Science Project has a glass biosphere that has been sustaining itself for the last 2 years! However, we used cherry shrimp because they require less salty water, meaning there’s more plants that will survive in a cherry shrimp habitat than in a brine shrimp habitat. If you live in Portland, OR, we happen to know that there are shrimp and plants at Pets on Broadway in NE!